What is your idea of the perfect poolside? The weather? The company? The drinks? 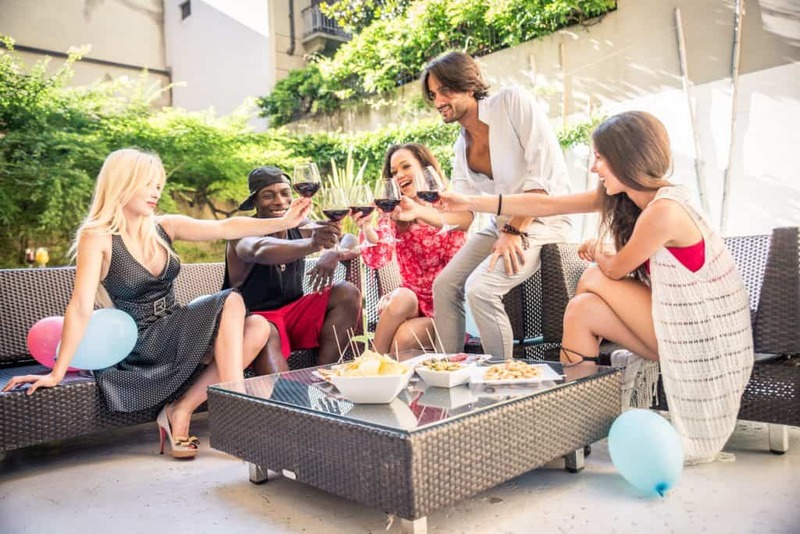 Depending on your mood, budget, and garden there are some different ways to ensure you have the perfect poolside you crave. The Ancient Romans got it right, and in some places like Marrakesh, it’s still used as an iconic and necessary part of daily life. It’s a pool of glorious cool blue water in an outdoor space. It’s the perfect poolside around which to entertain and in which to cool off. In fact, this is a simple design that you can use for a relaxed outdoor space even now. However, to get the most out of it, you need to ensure that the area surrounding the pool is just as good as the water itself. Read on to find out more. 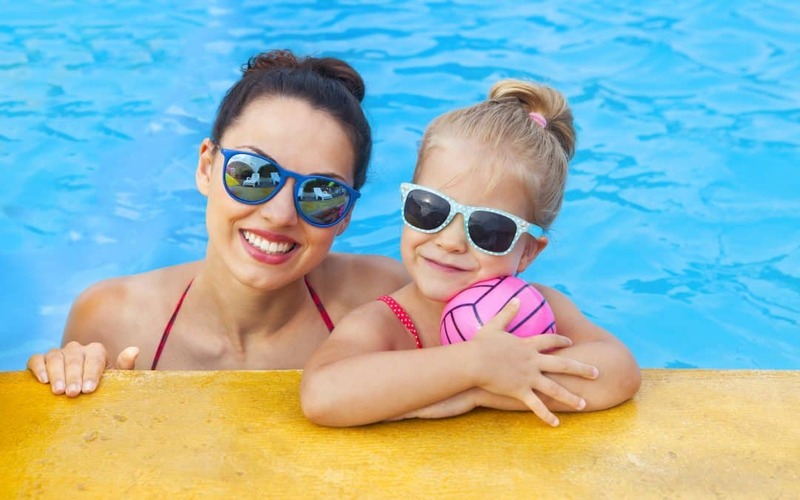 Whether you have the space, and budget, for one of the large sunken concrete pools or prefer a wooden above ground number, a family pool is seriously fun during the summer. 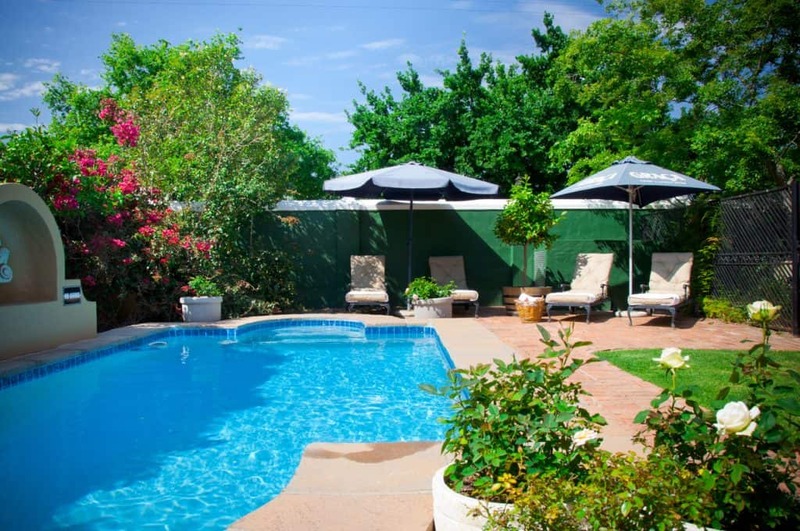 To maximise the space and its enjoyment create a poolside that fits the needs of YOUR family. Shade is an imperative for hot days when you are most likely using the pool. Trees can be a beautiful yet annoying provider of shade because of all the leaves that will fall in the pool. So trim back trees from the pool and invest in an umbrella, pergola, or sun sail. Cantilever umbrellas are stylish because they don’t have a central post, it’s placed to the side. Shade will spread out, uninterrupted. In fact, it can be particularly beneficial to create a shaded space over part of the pool itself as well as the surround. Cantilever umbrellas are perfect for covering parts of a pool too. Shade allows the whole family to be able to enjoy the outdoors no matter how hot the sun while minimising any health risks from sun exposure. Try Zanui for Cantilever Umbrellas and Luxo Living for highly-stylish covered day beds. 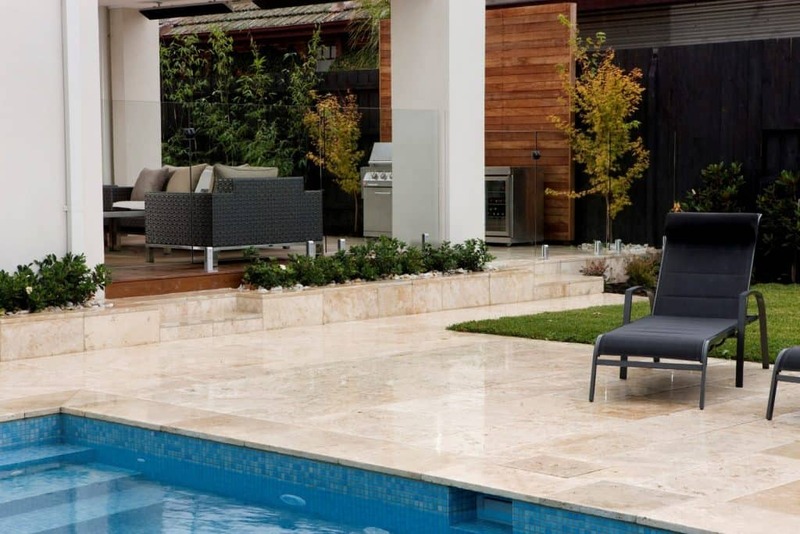 Comfortable furniture for lounging and seating is a must for the perfect poolside family area. Sun loungers, day beds, chairs, and dining settings mean you can spend all day relaxing, entertaining friends, or watching the kids play. Add a sound system, outdoor kitchen, bar, and big-screen TV and you may never leave. For a beautiful range of outdoor furniture, Acapulco chairs, dining tables, loungers, and more you can’t go past Interior Secrets. If your swimming pool area is more focused on entertaining rather than family fun, you may want quite a different setup. In fact, it you may want the pool to be a central visual feature for any garden parties and include things like floating lights to help achieve this. Adding illumination and luxe features, like colourful fluffy beach towels on the chairs will add atmosphere. You’ll want plenty of chairs and a good-sized dining table to ensure that your guests are comfortable. Although, for informal soirees eschew the more traditional dinner seating arrangements and go for small coffee tables, ottoman and stools. These work incredibly well because they look so stylish and bohemian, but also provide a space where people can rest their drinks, while still being flexible enough to move around into any configuration you like. For your next party, get high-quality wines delivered right to your door by Vinomofo, Australia-wide. They have a huge selection and you can put together your personalized wine selection. Last of all, if the thought of family bathing and parties on your poolside fill you with horror, you may just be a true sun worshiper, and that means your decking area need to reflect this. To create a sunbather’s paradise around your pool consider comfort and luxury. Full-length rattan sunbeds with padded tops work wonderfully in the situation. Ones that can be partially submerged in the water do too, as they allow the sunbathers to cool off and enhance their tan at the same time. Something that makes them the perfect poolside accessory; at least in a sunbather’s opinion. Ensure you have plenty of sunscreen, towels, plenty of fresh drinking water, a sarong, and stylish sandals. Try Sunday Somewhere for sunglasses beloved by celebrities and Jo Mercer for great summer sandals. Both around the pool and in it, the selection of tiles for your garden paradise is very important. If you are thinking of renovating an existing pool or installing a new one, there are three top pool trends that will set your pool apart – Global Fusion, Minimalist Contemporary, and Retro Vintage. 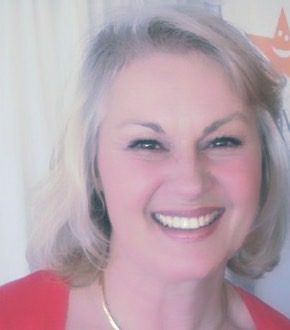 According to Rachel Gilding, Design Specialist with Beaumont Tiles, it is recommended that the tiles around a pool have a slip resistance of R11 or higher. 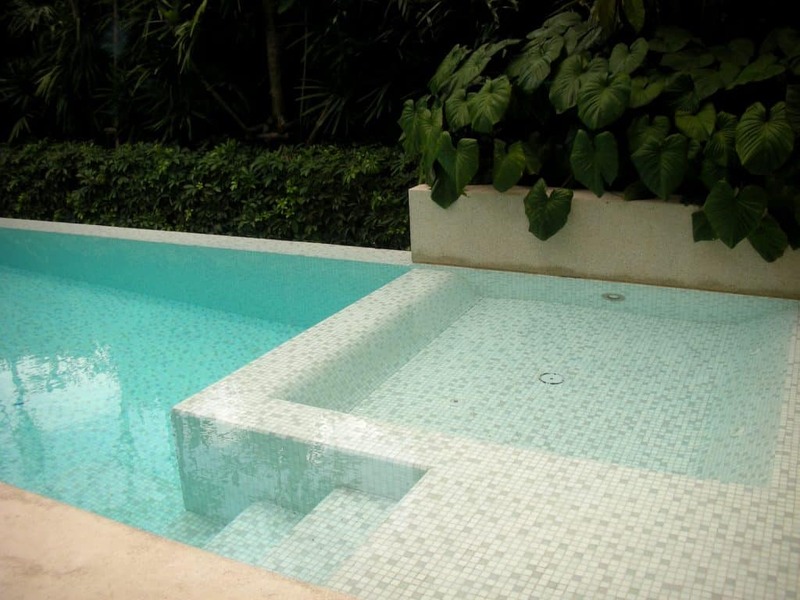 Inside a pool, tiles and mosaics used must have technical properties that are not affected by salt or chlorine. Global Fusion: This style combines the textured burnish styles of Morocco, with the forest edge of Madagascar and a functional Australian twist in a self-curated style of the well-travelled. Style with Moroccan blankets, woven chairs, oversized green plants, and weathered poolside lanterns. Minimalist Contemporary: Pure, natural, and evoking a sense of calm. It’s a whitewash with subtle asymmetrical statements within the white colour spectrum. Think unalike surfaces, alabaster materials and complex textures dancing through indoor to outdoor living zones to capture attention and direct it to focal points throughout the home. Homes styled in this theme are placed perfectly to frame your pool with seamless connection. Style your pool with white mosaic tiles, such as White Brick Bond from Beaumont’s to highlight the natural tones of the water. Use white timber-look tiles around the pool for a Hampton’s style retreat. Or Keystone White 600 x 600 for grandeur and sophistication. Retro Vintage: Everything old is new and again and it shows no sign of slowing down. Mid-century ‘cool’ meets innovative style. The key to Retro Vintage is selecting key pieces like an orb chair or patterned rug that makes your pre-existing contemporary interior pop and complement your newly renovated exterior. For the pool area, choose sandstone pavers such as the Travertine Almond with aqua blue mosaics such as Iris Azur Lustre. This is a classic combination. For a serious style statement choose Mosaic Glass Hexa Nero instead of the blue Iris Azur Lustre. It’s perfectly imperfect decor. Bliss! The experts in perfectly imperfect interiors. Contact Plush Design Interiors before you start your next build, renovation, or redecorating project.